My thinking got confused a couple weeks ago when I was writing about the Portland Democrats who want to raise the excise tax on beer by 2000% -- or tax kegs at 50% of wholesale, if you want to look at it that way. The stress of thinking that my state senator would sign on as a sponsor of such a Satanic piece of legislation had me all worked up, so that when I tried to enumerate the five small breweries in her district, I mentioned "Milwaukie's" as one of them. An alert reader -- thankfully there's one -- drew my attention to the fact that there is no such establishment in Portland. Of course what I meant was Philadelphia's on Milwaukie Avenue. One reason for my unfamiliarity was that I had never been there. Carla and I rectified that one evening recently by walking over there while our name slowly drifted to the top of the waiting list at Saburo's Sushi House around the corner on Bybee. As you'd guess by the "Steaks and Hoagies", Philadelphia's is primarily a sandwich shop, and most of the clientele is there for the Philly cheesesteaks. But they also sell half a dozen kinds of beer they brew themselves on a small system. This is another piece of evidence that we do indeed live in Beervana: a mom-and-pop sandwich shop decides to quietly brew their own beer on the side. They've been doing so for fourteen years. Since we had an eye on the clock that night and were saving our appetite for Saburo's, we took the rare action of ordering samplers. For the $4.25 price of a pint, they'll serve you three little 6-ounce tasters. Our favorites tended to be the darker beers: the Ben Franklin Brown was the best beer in the house. The Mummers Imperial Stout was Carla's favorite, and the William Penn Porter wasn't bad. We weren't impressed with the Independence IPA or the Spectrum Amber. 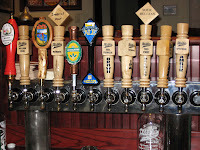 They also have a few rotating guest taps, which had a southern Oregon bias during our visit -- Mia and Pia's Double Chocolate Stout and Klamath Basin's Drop Dead Red were joined by Laurelwood Tree-Hugger Porter and Cascade's Defroster. It seems like Klamath Basin beers are appearing at more and more places since I originally rewarded community service points for KB beers to SuperDog -- for instance, Claudia's was serving Klamath's Brown a couple weeks ago. But it's been a few years since I've seen Mia and Pia's on a smaller taplist like this, so I'll give CSPs to Philly's for that. The laid-back atmosphere was also very appealing. We weren't in a position to try the sandwiches -- or the Tastykakes -- but the grill area behind the counter was meticulously clean, and the diners looked happy. If you're down in Sellwood, it would be a great place to stop in for a sandwich and a pint. Check out these Philadelphia ratings. Ouch! Tough crowd, those Beer Advocates. In fairness to Philly's, those reviews are 1, 3, 4, and 4.5 years old. The 4.5-year reviewer really had it in for Philadelphia's; he provided most of the dismal BA beer reviews also. An "F" for Ben Franklin? Well, it was more like a "B" on my visit. In fairness to the reviewers, sometimes beer at these small places is a little off (think Clinton Street, Tugboat).